If you love adorable statement pieces then you have to know about Kendra Scott Jewelry! The Sorority Secrets had an opportunity to link up with this adorable Texan designer at her Scottsdale location grand-opening and we have been obsessed with her jewelry ever since! Kendra Scott Jewelry has a total of 7 locations- four in Texas, one in Beverly Hills, one in Scottsdale, and another location opening up in Newport Beach! You can also find many of her jewelry at Nordstrom. Kendra Scott and The Sorority Secrets have teamed up to give one special reader this beautiful Harlow necklace that Sakura is wearing. It's a value of $195.00 that one lucky reader will win! It makes a simple outfit turn into a marvelous outfit and this beautiful Goldstone color has the perfect amount of shimmer in it! Also we have a special promo code just for our readers to use to get 15% off your entire purchase until 3/20th! Make sure to check out all of Kendra Scott's other stunning pieces! Step 3: Share The Sorority Secret's Kendra Scott Giveaway Facebook post on your personal Facebook. 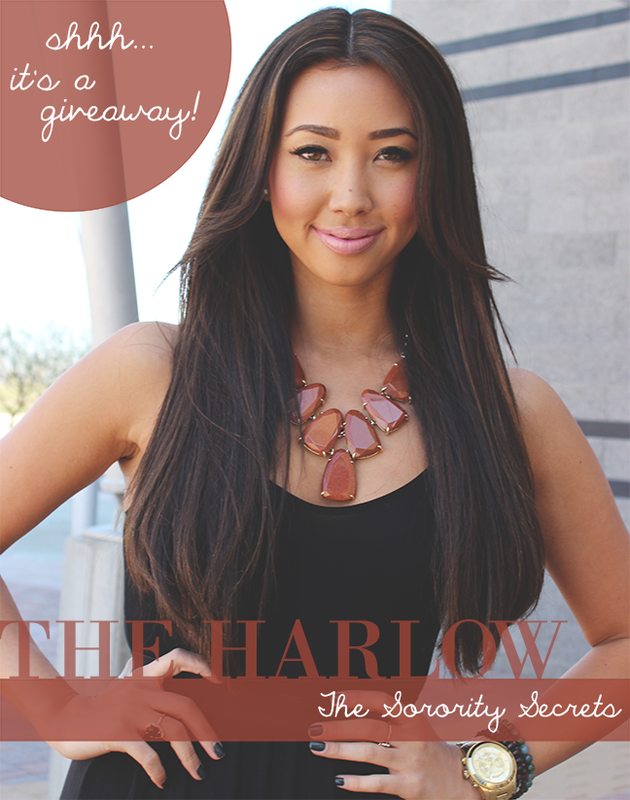 Step 4: Leave a comment below and tell us where you would wear The Harlow necklace! Make sure to leave your email address so we can contact you if you win! Good luck and thank you to Kendra Scott and her wonderful team! I would wear this beautiful necklace to the beach and/or summer party. I would pair it with a cute plain colored summer dress and/or jumper so that it can be my statement piece. I would love to wear this beautiful necklace to my executive board and formal chapter meetings! So gorg! Love 'The Harlow Necklace'! I would wear it my first art gallery exhibition opening! I would wear it to my bff's rehearsal dinner! I like both on FB (Grace Bowles Inman) and I shared the giveaway too: https://www.facebook.com/awhdarling. First of all, this necklace is GORGEOUS. :) I would love to win it! Every year, I take part in a luncheon and fashion show for the Grace Centers of Hope, a great Michigan organization providing shelter, food, and support for the homeless, addicted, and struggling. Grace Centers runs all sorts of programs to from life-skills to job-related education and really provides a sense of community for those struggling in Southeastern Michigan. One of the best parts, is that amazing beautiful women from the shelter get to walk in the fashion show in beautiful gowns by Oscar de la Renta and other crazy amazing designers. These women so deserve it! Everywhere! I love this necklace so much! I would wear this to work, weddings, and on nights out! It's so versatile! I love, love, LOVE this! I would wear this gorgeous necklace with a cute maxi dress at a Spring gig. I'm a local singer/songwriter & I think this necklace would be so pretty to wear with my leopard guitar strap & I have red hair - I can just picture how adorable this would all be at an arts festival or local coffee shop performance! I would wear this necklace everywhere! Definitely a date night must-wear! I would wear this necklace with a cute simple shirt and jeans everywhere. Love Kendra Scott! love this necklace... I'd wear it with a black monocrome outfit (and cheetah heels) to drinks with my girlfriends. I liked your page, kendra's page, and shared it on fb. I would wear this necklace to my upcoming Vegas trip celebrating graduating from college! We're going to see Elton John and this would be a perfect accessory to wear to a concert! I would wear the Harlow necklace with a black maxi shirt (probably my favorite thing ever), loose fitting tank and my new leather jacket. Top that off with my Lucky Brand western boots and I would be good to go for a concert or a night out to dinner with my girlfriends. I am a huge fan of statement necklaces since large earrings are often too heavy. I would complete my outfit with a few of my own Kendra Scott rings! nora.snoddy@gmail.com. Thank you for giving away such a beautiful piece! I would LOVE to wear this to the Barristers Ball for my Law School! It's a formal event and my dress is gold! I think it would look great! Im obsessed with statement necklaces and this one would go with everything! I love Kendra Scott jewelry and would love to own a big piece of hers like this one. I would love to wear this with a blank tank and khaki shorts and some wedges this summer out at a music festival or on a date night with my fiancé. Its just absolutely stunning! Love this necklace and I'd wear it with jeans and a top or a sundress! like and shared! love this necklace, I would wear it with with everything, think it would look great either with a summer dress or jeans and tank top! I am obsessed with this necklace. I would wear this with my business causal or professional outfits while reading bills and resolutions on the floor of the Texas House of Representatives. Other than work, I would wear this with maxi dress's and casual shirts. LOVE this necklace!! I would wear it with a black peplum top and leopard skinnies! I would wear this necklace to a beach wedding in April! After the wedding, I'd wear it every chance I get. Eeeek, this matches the KS color bar bracelet I created! I'd wear the necklace at any UT sporting event-have to be color coordinated for my Alma Mater! I would wear this necklace with my Danielle earings to UT baseball games this spring, ADPI alum events and on the weekends out and about in ATX. It's super cute with casual jeans or maxi dresses, but you can wear it with dresses and heels too. I love all KS jewelry! I would wear this to my sister's baby shower that I am hosting in May. I have been thinking about adding a Harlow to my collection and I love this one in shimmery goldstone! This is my favorite stone that Kendra Scott uses in her jewelry collection! Perfect necklace to wear out for my 2 year anniversary adventure coming up :) "The crowning jewel" to my outfit for a romantic night! Definitely a beautifully bold statement piece. I would wear this necklace to my sister's engagement party! 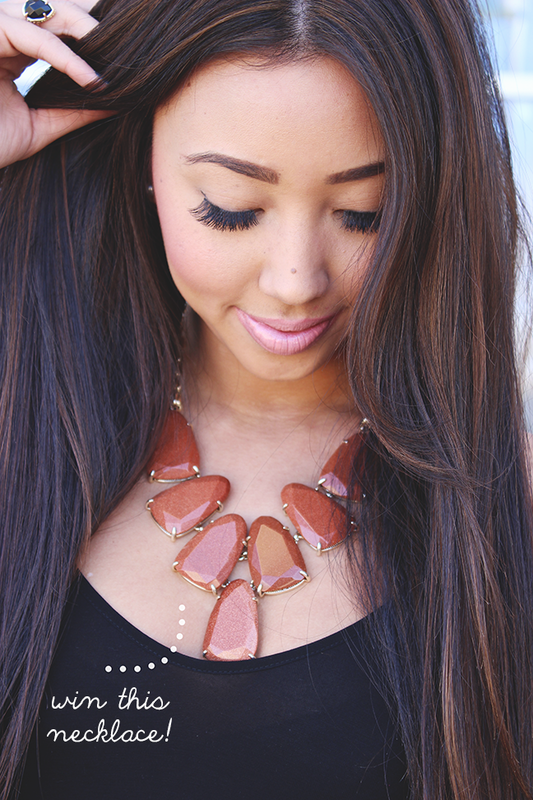 Love love love the Harlow necklace and KS! I would wear this necklace everywhere!! It would also look extra spectacular around my neck at an upcoming wedding I am attending :) Love KS! I would love to wear the Harlow necklace to all the bachelorette/bridal parties I have this spring for my friends. Those burnt orange stones fit in great here in Austin! I'd wear the Harlow necklace with my cowboy boots and go two-stepping. This necklace is stunning! I would wear it with almost any outfit because it can go from bohemian to glam. It would go great with my tan tribal print maxi this summer! Thank you! I love this necklace! I'd wear it to an upcoming wedding! Obsessed with this necklace! I would love to pair it with a burnt orange maxi skirt and white tank. I'd wear it during the day and transition into an outfit at night by adding a denim button-down or jean jacket. This necklace is so beautiful that I could wear it all of the time! I think it would be an excellent addition to any chic outfit and I would love to wear it out with my girl friends!!!!! Love this necklace, perfect for a UT football game! I love this necklace, so versatile for work, school, and lots of fun on the town!! Absolutely love this necklace! Would love to wear this for my graduation along with my matching Danielle earrings. Honestly I could think of about a hundred outfit ideas that would work perfectly with this accessory, such as my new ivory maxi dress or a cute top with denim high waisted shorts. The opportunities are endless! I'm dying to get a Harlow!!! I need something fab for a friends wedding in Mexico next month! Love, love, love this necklace with a dress or with a tank...Would wear it all the time. This Harlow necklace would be perfect with my prom dress and my gold strappy heels. I would pair them with other Kendra Scott accessories: the Willow Statement earrings in goldstone and the Roni cuff bracelet in gold. If I won this, I would not only wear this at prom, but I would wear it everywhere! It's perfect for summer and I am in love with it! The Harlow statement necklace will be my go to necklace from everyday, to date night my husband, to social events, to meetings. I am in love with 2 colors actually. I love the black and the turquoise. I hope this contest will get my closer to 1 of them!!!!! I love this necklace!! I would waer it to work or for a nice evening out!! Will go well with a casual outfit, jeans and top or a nice evening dress too!! I would wear the Harlow necklace with a black tunic and tights. It would be perfect for the Elton John concert my girlfriends and I are attending at the end of March! I absolutely love Kendra Scott's jewelry. I actually have the matching earrings. I would wear this necklace with my new sequinned granite colored shoulderless dress to my friend's formal wedding (she is giving her bridesmaids Kendra Scott earrings as gifts too) in April and with a red satin one-shoulder dress to a formal also in April. I would also dress this down with jeans and t-shirts all summer long. This necklace would be awesome to wear to University of Texas football games! It's the perfect burnt orange color and would go great with a white dress and cowboy boots! I also have a matching Jana bracelet from Kendra Scott in goldstone too that I could pair with it! This chick is so hot, i wish she would have my babies.